The last couple weeks the top 3 things that have brought people to this blog have been people wanting to know why cyclists shave their legs, directions to the Manitou Incline and endurance food. I’m sure the reason I’m getting visits for why cyclists shave their legs is because my recent post about leg shaving. 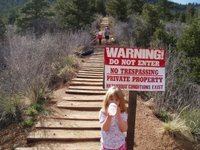 I’ve written a few times about doing the Manitou Incline but I’ve never written how to get there. It’s a 2,000 vertical foot scar running straight down Mount Manitou. I must live 6-7 miles away even by the way the bird flies and I can see it from my house. Just drive west until you’re at the bottom of it. The important thing is to not park in the Pikes Peak Cog Railway’s parking lots or their spaces on Ruxton. Either park in the Barr Trail parking lot or down Ruxton by the Iron Springs Chateau Melodrama. The Barr parking lot is full a lot of the time. In the summer you have generally have to be there before 6 AM to find a parking spot. You can either start up the Incline on a trail out of the Barr parking lot that is at the opposite end from Barr Trail or the bottom of the Incline by cutting through one of the Pikes Peak Cog Railway parking lots. I doubt they like people doing that. At a 40 minute pace, the point the trail from the Barr parking lot joins the Incline is about 4 minutes from the bottom of the Incline. 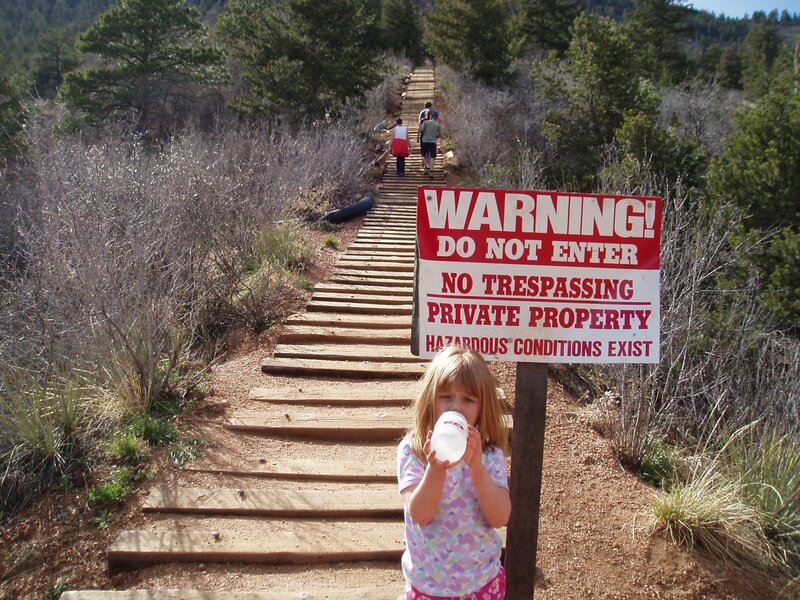 The middle part of the Manitou Incline is owned by the Pikes Peak Cog Railway and you are trespassing if you do it. For how to eat for endurance sports, take a look at my post on how I use Hammer Nutrition products. I also have a post on what I did for nutrition during my 2006 solo Race Across America attempt. You can get 15% off your first order by using my customer number 10704. Even though I believe Hammer has the best fueling products and supplements on the market always race with what you trained with. Their products are different than the sugary sports drinks out there and can take a while to dial in if your used to the other stuff.